use a microwaveable bowl, combine rice flours itch water first. stir well and pour out hot mixture on corn starch which is spread on the prep table. rub it with corn starch and place it in parchment paper. 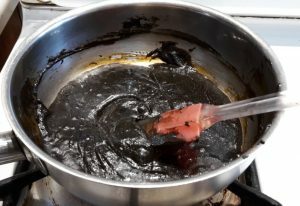 Pour sesame paste and molasses in a metal pan on medium heat and blend them by folding with silicone spatula. After 5 mins, add 1/3 cup of tapioca starch to the mixture and stir. When the mixture turns thick, turn off heat and pour the mixture to a foil paper about 11″ X 8″ with a thin layer of starch on its top. Fold in the mixture with the foil paper. Gently roll it and freeze it for half an hour. Wait for your mochi are ready to be stuffed. 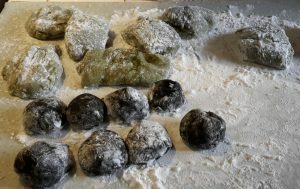 Prepare the mochi dough by flattening and rolled into a thin layer on a quarter size baking sheet, on which a thin layer of starch is dusted. Use a 2″ diameter cookie cutter to cut dough into circles. fill 1.5 tsp of ice cream into a mochi circle, squeeze four sides and roll it on a starched surface , quickly put it in a 4 oz sauce cup . Freeze it quick.